This is the description of the Go API bindings for the Segment Display 4x7 Bricklet. General information and technical specifications for the Segment Display 4x7 Bricklet are summarized in its hardware description. const UID string = "XYZ" // Change XYZ to the UID of your Segment Display 4x7 Bricklet. sd, _ := segment_display_4x7_bricklet.New(UID, &ipcon) // Create device object. Returns the segment, brightness and color data as set by (*SegmentDisplay4x7Bricklet) SetSegments. 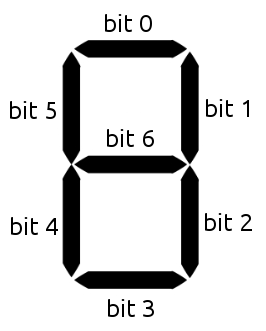 You can stop the counter at every time by calling (*SegmentDisplay4x7Bricklet) SetSegments. For getter functions this is enabled by default and cannot be disabled, because those functions will always send a response. For callback configuration functions it is enabled by default too, but can be disabled by (*SegmentDisplay4x7Bricklet) SetResponseExpected. For setter functions it is disabled by default and can be enabled. See (*SegmentDisplay4x7Bricklet) SetResponseExpected for the list of function ID constants available for this function. A callback can be registered for this event with the RegisterCounterFinishedCallback() function. This function returns the ID of the registered callback. An added callback can be removed with the DeregisterCounterFinishedCallback(callbackID uint64) function. This callback is triggered when the counter (see (*SegmentDisplay4x7Bricklet) StartCounter) is finished. The (*SegmentDisplay4x7Bricklet) GetIdentity function and the (*IPConnection) RegisterEnumerateCallback callback of the IP Connection have a deviceIdentifier parameter to specify the Brick's or Bricklet's type.